If you love clicking photos on your smartphone then you should have Google Camera on your smartphone. Because Google Camera captures awesome shots. But Google Camera is not available for the maximum android smartphone. Asus Zenfone Max Pro M2 comes in this list. Though the developer has managed to port the Pixel 3 Google Camera for Asus Zenfone Max Pro M2. You can install the ported Google Camera on your Asus Zenfone Max Pro M2 through this guide. 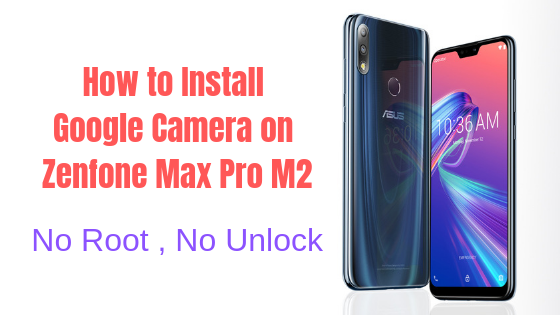 To install Google Camera on Asus Zenfone Max Pro M2 you need to enable Camera2 API. This is by default disabled by ASUS. But there is good news that ASUS allows you to enable it without rooting the device even without unlocking the bootloader. Mean if this is your just new purchase and you don’t want to unlock the bootloader as well as root then this is the best method to install G CAM on your Zenfone Max Pro M2. You don’t need to install Custom TWRP Recovery, just a few commands and you will be able to install Google Camera on your Zenfone Max Pro M2. As we are not rooting the device and even unlocking the bootloader mean there is no data loss and you will get all the OTA update after enabling Camera2 API and you will be able to install those OTA Updates as there is no Custom Recovey. Hope you have got the clear idea of how much safe this method is to install Google Camera or GCAM on your Asus Zenfone Max Pro M2. So let us check how to do it. Enable Developer option- Goto Settings > About phone > tap Build Numbers 7 times. This is an easy and safe and secure way to install Google Camera on your Asus Zenfone Max Pro M2 as no data loss and not unlocking the bootloader so that you will get all the OTA updates after installing this Google Camera on Zenfone Max Pro M2. I tried this, and the app works. However, it crashes every time I want to switch to Selfie Mode. Any idea if there’s a way to fix it?